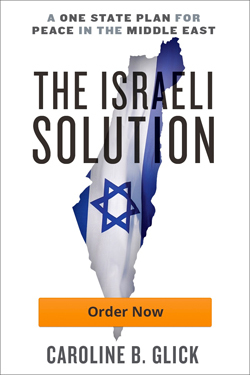 Jewish News reviews The Israeli Solution: Is it time for the two-state plan to be ditched? Since the 1990s, the dominant consensus in foreign policy circles is that only a two- state solution can resolve the Israeli-Palestinian conflict. Creating a Palestinian state has become an article of faith across the political mainstream, both in Europe and the United States. Yet with the collapse of peace talks in Washington, the recent reconciliation between Fatah and Hamas and the current conflict in Gaza, that solution looks increasingly unlikely. So is it time for the two-state answer to be ditched altogether? That is certainly the conclusion of Caroline Glick in her new book, The Israeli Solution: A One State Plan for Peace in the Middle East. Glick pulls no punches. She describes the two-state plan as “among the most irrational, unsuccessful policies the United States has ever adopted”.